The Rolling Stones's Mick Jagger, Keith Richards, Ronnie Wood and Charlie Watts arrived in Australia, hours before Jagger's girlfriend L'Wren Scott was found dead in her Manhattan apartment on March 17. The 49-year-old fashion designer was found dead after allegedly hanging herself on a doorknob. A rep for Mick, 70, said the singer was "completely shocked and devastated" following the news of her death, according to Daily Mail. Mick and the rest of The Rolling Stones traveled to Perth for their Australian tour, which kicks off on March 19. Upon landing in Australia this morning, the band posted a photo of themselves, standing on the tarmac in front of their private jet, which is inscribed with the band’s trademark tongue logo. 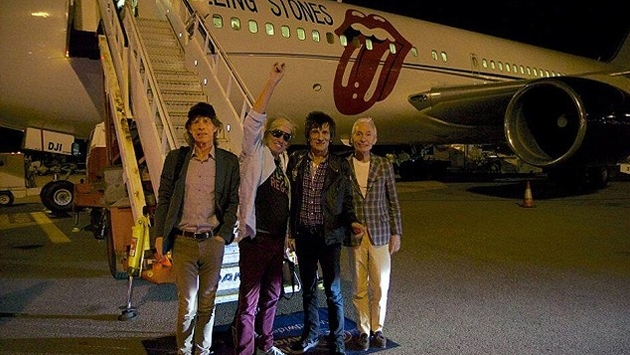 Mick, Ronnie, Keith and Charlie looked thrilled to be back in the country as they stepped off the plane. And Mick clearly couldn't wait to hit the beach. He later tweeted a photo of himself on Perth beach, however, he has since deleted the photo, following the news of his girlfriend's death. While Mick deleted the photo, it still exists on fan accounts. It's so sad to know that in just a few hours, Mick would learn the fate of his longtime girlfriend. Mick and L'Wren had been dating since 2001.